Attention deficit hyperactivity disorder (ADHD) in adults is a prevalent, yet under-appreciated, under-researched and poorly understood condition. Given this, it is imperative that information and awareness regarding this condition are made more widespread, both amongst the general public and amongst healthcare professionals. Further, given our poor understanding of the aetiology of the condition, meaningful translational research that migrates into and better informs clinical practice must be a priority. 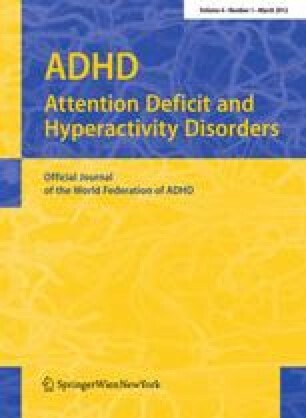 In this brief review we highlight areas regarding the clinical diagnosis and management of ADHD in adults (guidelines, rating scales, pharmacotherapy, psychotherapy) as well as areas of promising translational research (genetics, neuroimaging, sleep and circadian rhythms, animal models of ADHD). We address some of the challenges presented for both clinicians and healthcare providers and research scientists working to improve the lives of those adults with ADHD. A. N. Coogan, A. Dobrean, R. M. Donev, L. Mateescu, U. Müller, J. Thome, B. I. Voinescu contributed equally to this article. This review is based on the results of an exploratory workshop that took place on 17–19 December 2011 at Babeş-Bolyai University, Cluj-Napoca, Romania, and was financially supported by CNCS—UEFISCDI, project number PNII—IDEI/WE-2011-056.